The loss of any beloved actor hurts, but there’s an extra tinge of poignancy to the passing of Bruno Ganz at the age of seventy-seven. 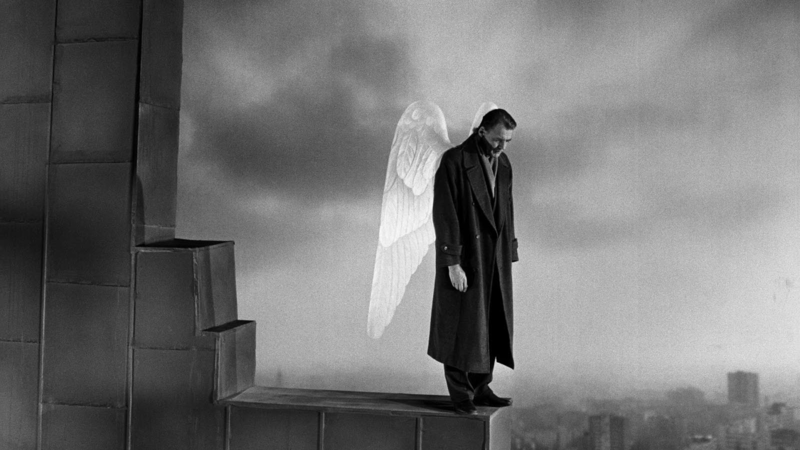 Delivering one of his most subtly moving performances in Wim Wenders’s Wings of Desire (1987), Ganz plays Damiel, one in a flock of angels who wander the still-divided city of Berlin, listening in on the innermost thoughts of people unaware of their presence. Their eavesdropping is “both empathetic and voyeuristic,” as Michael Atkinson points out in the essay accompanying our release, and “most of what the angels hear from their earthling subjects is worry, worry, worry.” Nonetheless, as Damiel confides to his close friend (Otto Sander), he’s been tiring of his “transcendent existence” and yearns to feel “a weight within that would end this boundlessness and tie me to earth.” He’s tempted to experience even the simplest of pleasures such as a smoke or a cup of coffee—“and if you do it together,” Peter Falk tells him, “it’s fantastic”—and reaches his breaking point when he falls for a trapeze artist (Solveig Dommartin). Damiel casts off his wings, and with them, his immortality, plunging to earth where he can touch and smell and love and sense the passing of time. He can also cheat death by setting down an immortal record of his mortal life. He can write: “I know now what no angel knows.” Ganz is gone, but we still have that declaration, along with more than a hundred film and television performances. Hopper and Ganz would eventually get along just fine, but not before coming to blows at the outset. Ganz once told the Irish Times’ Donald Clarkethat he was “jealous because [Hopper] was a Hollywood star and I was nothing, really.” Which wasn’t entirely true. Born to a working class family in Zürich, he was acting professionally by the time he was twenty, working with top theater directors within just a few years, and in 1970, he became a cofounding member of Peter Stein’s famously radical Schaubühne ensemble. Around fifteen years into an off-and-on career in movies, Ganz starred in Eric Rohmer’s The Marquise of O (1976). That’s not nothing. Over the weekend, the Neue Zürcher Zeitung ran several remembrances, including Schlöndorff’s, in which he recalls that Ganz had wanted Romy Schneider, with whom he’d had an affair ten years before, for Schygulla’s role. But by this point in her life, Schneider was ailing “both physically and emotionally” and wouldn’t have been able to withstand conditions on the set of film shot on location in an actual war zone. Schygulla turned out to be a trooper, calming Ganz’s nerves as sharpshooters carried out their “macabre target practice” on innocent civilians simply trying to cross a street. Before they arrived in Lebanon, Ganz and Schygulla had clashed during rehearsals in Munich. He couldn’t take her seriously as an actress, even after “her great success” in Rainer Werner Fassbinder’s The Marriage of Maria Braun (1978). Schlöndorff notes that even twenty years after Fassbinder’s death, following a screening of Schlöndorff’s Baal starring Fassbinder as Brecht’s poet, Ganz couldn’t get over how “unbearably arrogant this guy” was. For her part, Schygulla couldn’t relate to the methods Ganz had developed during his Schaubühne days. Fifteen years on, it’s easy to forget how heated the debate over Downfallbecame in the mid-2000s. “To play Hitler is to walk into a paradox,” wrote A. O. Scott in the New York Times. “We still want to understand not just the historical background of German National Socialism, but also the psychological and temperamental forces that shaped its leader. At the same time, though, there is still a powerful taboo against making him seem too much like one of us. We want to get close, but not too close.” One of the film’s harshest critics argued in an open letter published in Die Zeit, a widely read weekly in Germany, that Downfall takes its viewers “into a black hole in which they are led, almost unnoticeably, toward looking at this time through the eyes of the perpetrators, and generates a kind of benevolent understanding of them.” That critic was Wim Wenders. Ganz had appeared in dozens of international productions before Downfall,but the film’s success—it was nominated for an Oscar for best foreign language film—had directors calling on him from around the world. He played professors in Francis Ford Coppola’s Youth Without Youth (2007) and Stephen Daldry’s The Reader (2008); he reunited with Theo Angelopoulos, who’d directed him in Eternity and a Day (1998), for The Dust of Time(2008); Ridley Scott cast him in The Counsellor (2013); he was a delightfully amusing guest in Sally Potter’s The Party (2017), a Virgil-like guide in Lars von Trier’s The House That Jack Built (2018), and Sigmund Freud in Nikolaus Leytner’s The Tobacconist (2018). And we have at least one more performance from Ganz to look forward to—if he’s made the cut. Ganz was cast as Judge Lueben in Terrence Malick’s Radegund, which was shot in 2016 and will hopefully be released later this year. That judge is likely Werner Lueben, Senate President of the Reich Military Tribunal, who, directly or indirectly, sentenced hundreds of people whom the Nazis perceived as enemies to death, among them, the conscientious objector Franz Jägerstätter, who’ll be played by August Diehl. Radegund would be Ganz’s 121st credit at the IMDb. Not every single one of those performances will prove to be immortal, but a good number of them, certainly including his films with Wenders, possibly his work with Rohmer, Schlöndorff, Herzog, and yes, his Hitler, will. Psalter surrounded on every page by an untitled 18th century English History manuscript. Quarto: 19.5 X 14 cm. 171 parchment leaves plus 1 unsigned with vertical catchwords. A fifteenth-century manuscript Psalter with an early eighteenth-century English manuscript written in the margins throughout. The English work is mainly historical with long polemical passages concerning the Church of England. The primary aim of the author, who writes with a strong Catholic bias, is to demonstrate the illegitimacy of the reformed Church. This copy has been recently rebound in appropriate style , of full calf and clasps. The illuminations in this volume is exquisite, with all of the large initials done in gold and colors, with great skill. The nine large (7-line) gilt initials are all accompanied by full illuminated borders containing leaves, fruit, flowers, and vines in many shades of blue, red, green, yellow, and orange, with gilded highlights. There are several other 4-line gilt initials in the text as well as many two and one –line initial letters. This manuscript prayer book contains the complete text of the Psalms of David. The first 118 Psalms. These are followed by eighteen named Psalms(Beth, Gimel, et cetera) These are followed by Psalms 119 through 150 and, finally, eight other Psalms. A sixteenth century inscription on the final leaf informing us that this book belonged to Alice Lupset (died 1543/4) wife of the goldsmith Thomas Lupset (died 1522/3) and mother of the English Humanist. Pope’ were quite possibly made by Alice Lupset herself. A nineteenth-century inscription on the rear flyleaf records the names of the subsequent owners of this manuscript: “This book belonged to James Leatherbarrow in 1751. See the name on the first page_by whom it was given to his Brother John Leatherbarrow, who gave it to his Daughter Mrs. Ann Lithgow, who gave it to her edest Daughter Mrs.Gasney & from her it came into the possession of her sister Elizabeth Lithgow. February 14, 1841” In another inscription John Lithgow identifies hiself as the son of Anne Lithgow. Surrounding, or rather filling the entire margins of the Psalter. The work is part religious, part history, and part chronicle. The, as of now, unidentified author’s purpose is to expose the usurpation of the Church and the throne of England by Protestants, beginning with Lord Somerset, and to demonstrate the legitimate authority of the Catholic Church by tracing the history of Christanity in England and chronicling – using lists excerpted from other sources- the succession of the kings and bishops of England. A number of printed and at least one manuscript work are quoted in full while others are digested or presented only in excerpt. The author of the manuscript then comments then comments upon these works, often at length, making the voices of our author and his sources difficult to parse. The author cites a number of late seventeenth-century works, including Burnet’s “History of the Reformation”,and Jeremy Collier’s Historical Dictionary. A reference to John Harris’ Lexicon Technicum gives a terminus post quem of 1704.